Rose and walked the dog and then went across to the Bothy and did some more work on understanding the presbytery materials which have been given to me. I also dealt with some emails (and a couple of telephone calls). After a snack lunch I spent the afternoon in the spare bedroom starting to make some sense out of the chaos which is there. 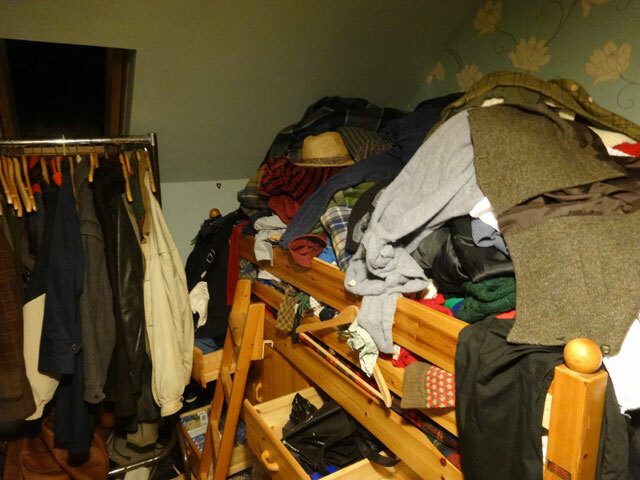 For a year I have been living without a wardrobe or very much in the way of cupboards. Now everything is going to change. As a first step I am turning the summer house into a make-shift store to enable the spare bedroom to be converted into an office and workroom for Rachel. Watch this space! We dined in the farmhouse and then I drove Mum into Duns for the Guild meeting. I returned and Rachel and I watched an episode of Endeavour before the News. I am horrified by the terrorist events in Paris in Paris and I despair for our world.